This is my third post in a series about this award. Previous posts covered award-winning picture books as well as honorable mention and commended picture books. To see a compilation of many diverse book awards, please read Spotlight on Diverse Book Awards or click on the Award-Winning Books tag. 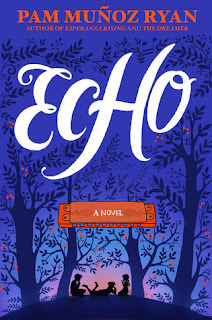 2016: Echo (2015) by Pam Muñoz Ryan [a Newbery Honor book]. This lovely, lyrical novel weaves together three individual stories into its powerful conclusion. I have had this one sitting on my TBR stack, eagerly awaiting the end of the school year. I will admit to quickly skimming past the reviews of others recently, as I didn't want anything to spoil my reading of this book! So I will leave my review at this ... it was well worth the wait! 2015: Silver People: voices from the Panama Canal (2014) by Margarita Engle. This novel-in-verse tells the story of the building of the Panama Canal through a variety of voices, both those native Caribbean people who built the canal itself as well as those of the wildlife and nature within the surrounding environment. The Historical Note at the end shares additional details and the author's personal connections to these stories. 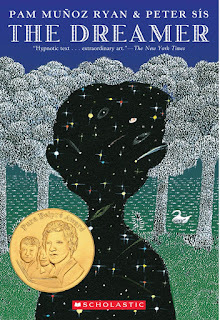 2011: The Dreamer (2010) by Pam Muñoz Ryan and illustrated by Peter Sís [Pura Belpré Award winner]. This fictionalized biography of celebrated Chilean poet Pablo Neruda (née Neftalí Reyes) focuses mainly on his childhood, interweaving chapters in an intimate third-person voice with illustrated poetry in the style of Pablo Neruda. Excerpts from actual poems are provided at the end, following an Author's Note about her research and inspirations. It is an interesting and emotional story that also draws attention to the focus on ordinary workers and social justice that defined his writing career. 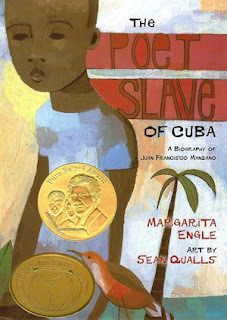 2006: The Poet Slave of Cuba: a biography of Juan Francisco Manzano by Margarita Engle and illustrated by Sean Qualls [also winner of the Pura Belpré Award]. Poetry is the perfect vessel to convey the early life of Juan Francisco Marzano, born into slavery in Cuba, who overcame his lack of education and many hardships to become an admired poet. 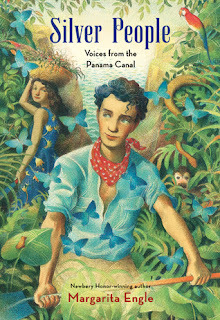 The story is told through poems in Juan's voice as well as those of other characters around him, providing addition insights and perspectives. There are many disturbing events related to slavery and the treatment of slaves in this story, making it suitable for older readers. The back matter includes more historical information about Juan, as well as selections of his actual poetry (both in the original Spanish and translated into English by the author). To see a compilation of many diverse book awards, please read Spotlight on Diverse Book Awards or click on the Award-Winning Books tag. Margarita Engle and Pam Muñoz Ryan seem to be the heavy hitters of the Américas Awards!